controlled release hard gelatine capsules. 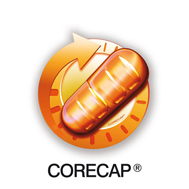 CORECAP® tecnology can be applied to finished products in hard gelatin capsules. Each application of CORECAP® on finished products is protected by patents issued or pending.